We are looking for innovations in the sectors of environmental protection and sustainable development! EEC Green will accompany COP24, the most-important global conference on climate protection. The event, to be held at the International Congress Centre and the Spodek Arena in Katowice, will be attended by over 30 thousand guests from 196 countries. Planned for 4-5 December 2018, the special edition of the EEC Green Congress will attract about a thousand people: politicians, entrepreneurs, heads of global corporations, experts and journalists – those for whom sustainable development is a major challenge of our times. Three parties will be represented in the debate: consumers, business, and the State (the regulator). We will discuss the issues of sustainable development, focusing on its most-important aspects: awareness among consumers, the responsibility of entrepreneurs, and the relevance of regulatory solutions. It is the ambition of the organisers of EEC Green that the debates and presentations followed by media reports, will contribute to the development of a new social and business pro-ecological order. Equally important, we also wish to present innovative projects, worth special attention, to our panellists, viewers, web followers and readers. During EEC Green, such projects might be presented by start-ups, as well as those who have progressed from the original formula, or even those who have never acted as start-ups (SME’s), as well as students, academic teachers and inventors with patents. 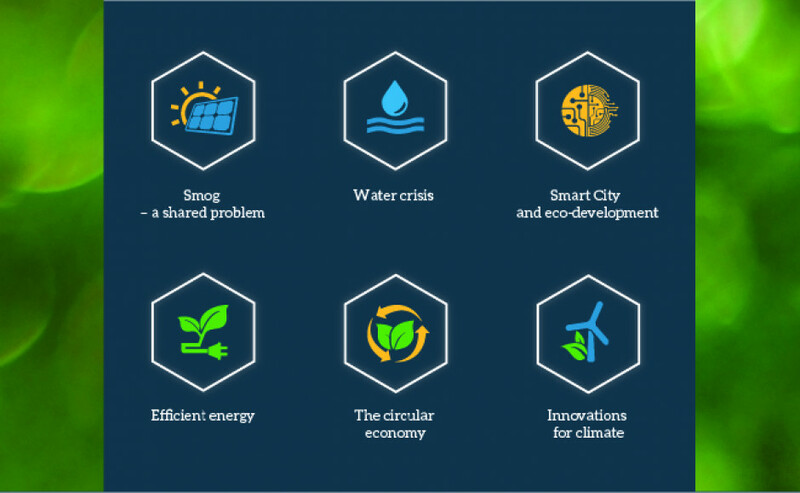 As a matter of fact, there is only one requirement, which is quite broad: the above contributions should be ideas supporting environmental protection and sustainable development (the subjects cover, inter alia, the water crisis, the closed-circulation economy, smart cities and eco-development, effective energy like RES and electromobility, and innovations in respect of climate or smog). Discover new development opportunities to advance your company/project, become known in the media, and make contacts with potential investors or customers! Let others become acquainted with your solution related to climate protection and sustainable development! An opportunity at EEC Green to focus the attention of potential investors or customers on your project. International networking, potential feedback from world-class experts and investors. Media promotion in the organs of the PTWP Group and social media, and free entry tickets to the event in Katowice. Selected projects will also be presented at EEC Green, and some of the authors will be invited to attend debates at the conference. Complete and send the application form by 20 November 2018. Wait for the decision that you have qualified. The submitted projects will be reviewed by the Chapter to select the best, most-promising, solutions.